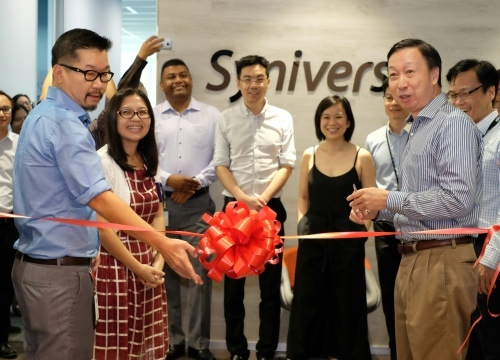 Of all the regions where Syniverse operates, Asia Pacific is an area where we’ve been particularly on the move in the last few years, and this month I had the honor of helping us mark a new chapter in our commitment to this crucial market. 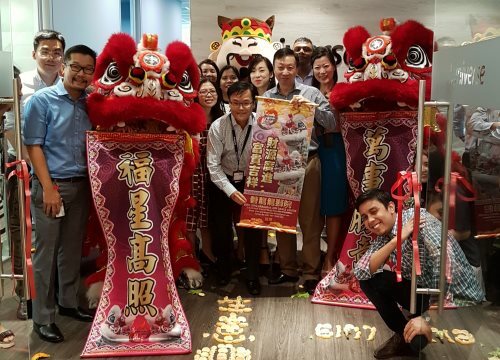 On Feb. 14, we inaugurated a new office in Singapore that will bring together a number of our colleagues and optimize our services in Southeast Asia and across Asia Pacific. 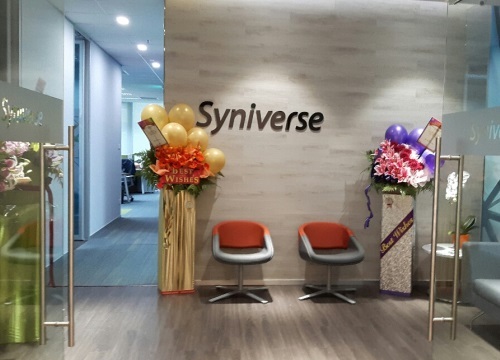 Syniverse has had a presence in the Asia Pacific market for over a decade, and through our acquisition of Aicent in 2014, we have significantly expanded our footprint here. Our customer base includes more than 300 companies across 50 countries, and our team has grown to over 500 professionals, with nearly 200 of those in Greater China. Continuing this growth, we opened the doors to our newest Asia office by inviting customers and special guests to a celebration that included a special ribbon-cutting ceremony and luncheon. 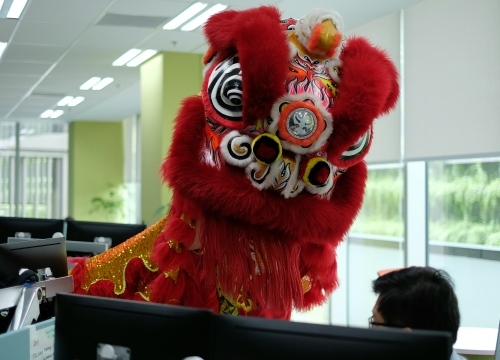 We also arranged for ceremonial lion dancers to give a small performance, which is a local tradition for new office openings and intended to bring prosperity. As you can see in the photos here, the dancers made for a memorable afternoon. Me (right) helping cut the ribbon to open our new office! Our new office provides several key benefits. 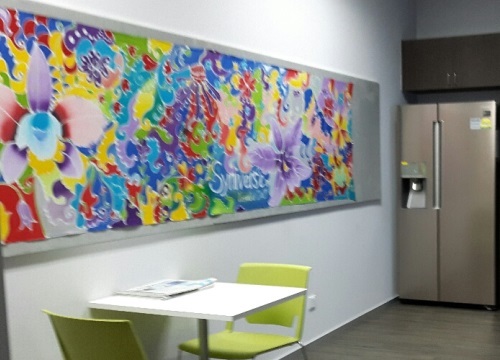 Located at the modern and centrally located Singapore Science Park, we’re now closer several of our biggest customers. This proximity will allow us to communicate more easily and deliver a higher level of service, right in the heart of Singapore’s business center. In addition, the new location brings together employees from Syniverse’s acquisition of Aicent, which became a part of Syniverse in 2014. As a result, we’ll be able to better consolidate our service offerings, have more seamless collaboration among various teams, and provide greater speed and innovation in our service to customers. Our new office marks just one more step in our commitment to the rapidly growing Asia Pacific market, and we’re excited about what’s ahead for mobile here. According to a recent GSMA report, from 2015 to 2020, mobile use will rise considerably, with the number of mobile connections forecast to increase by almost 25 percent and reach 4.8 billion. For the same time period, the amount of next-generation services will also soar, with the amount of 4G use predicted to grow from 46 percent to 79 percent. Big things certainly seem to be ahead with mobile in Asia Pacific, and our Singapore office can’t wait to be a part of this. Please check out some photos from our opening day here, and stop by to visit us if you’re in the neighborhood. Two red ceremonial lions and a “roving god of fortune” (back, center) will hopefully bring us much prosperity in our new space. The wall of our kitchen features a Southeastern Asian design known as a batik, which was painted by members of our employee association. One of the lions checks out the desks in our open-concept workspace. Our new lobby is open for business and ready to welcome visitors! Mun-Kein Chang joined Syniverse in 2014 and brings more than 15 years of experience in managing the development of advanced IPX and mobile network services. As Vice President of Advanced Signal and Network Interoperability, he helps lead Syniverse’s Network line of business, which includes Syniverse’s LTE and IPX solutions. Prior to joining Syniverse, Mun-Kein led the development of IPX data network services and solutions products for 11 years as Executive Vice President of Product Management at Aicent, which Syniverse acquired in August 2014. Previously, he was Regional President of Asia Pacific for GRIC Communications and was responsible for sales, marketing, operations and technical support for all GRIC customers and partners in the region. Before GRIC, he worked at Tandem Computers, providing consultation and professional services to major banking and telecommunication companies, and also held senior roles at Zenith Data Systems’ and Hewlett-Packard’s Asia-Pacific divisions. Mun-Kein holds a Bachelor of Science in electronics and communications engineering from the University of Surrey and also has a diploma in electrical engineering from Singapore Polytechnic.